This medieval Fiore War Hammer is from Windlass Steelcrafts Battlecry collection. Designed specifically to be used and made from 1065 high carbon steel, this war hammer displays a darkened finish and has been tempered to a low 50s RC. The steel battle hammer has gone through rigorous testing to ensure its quality. The hands on nature of the manufacturing by master smiths makes this line unique. 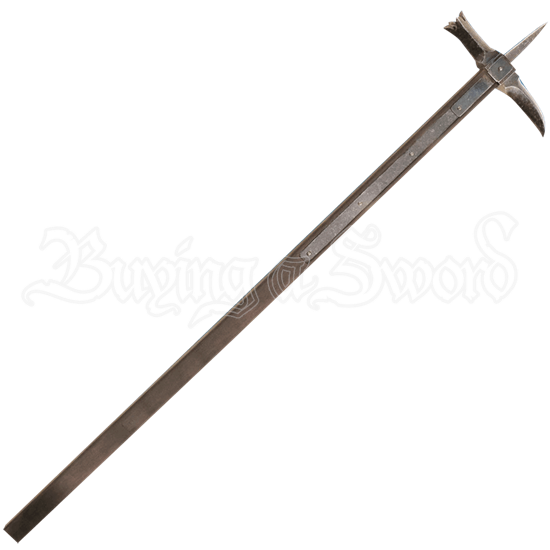 Featuring a pronged head balanced by a curved spike and topped with a spear point, this polearm is also known as a bec de corbin, or beak of the crow. Included with each Fiore War Hammer is a certificate of authenticity signed by each smith that touches the weapon through every step of the forging process.